TIME takes a look at some of the world's most innovative minds. 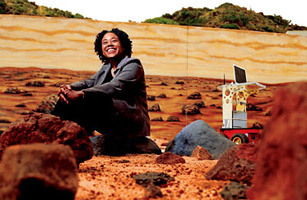 The engineer sits beside SmartNav, her prototype for an autonomous Mars rover, on a set of the Red Planet at NASA's Jet Propulsion Laboratory in California. Television critics will tell you that The Bionic Woman was just another cheesy '70s sci-fi series, but for Ayanna Howard it was a springboard to a career. When she was 12 years old, she became so captivated by the show's cyborg premise that she started reading books that reaffirmed the concept of integrating machines with humans. A thousand reruns and an electrical-engineering Ph.D. later, she's creating robots that think like humans for NASA's Jet Propulsion Laboratory. "The Bionic Woman showed real, brilliant people giving life through bionics," says Howard, now 32. "I figured I could do it too." After detouring from artificial limbs to artificial intelligence, Howard is currently developing software that will enable J.P.L. 's forthcoming Mars probes to choose their landing sites and navigate the Martian surface by mimicking the way a human might handle the job.Her "neural network" reacts the same way humans do when facing rugged terrain, avoiding steep grades and accelerating through straightaways. "People always look for the straightest, clearest path, so that's what we map to the robot," she says. The early result is SmartNav, a rover the size of a lawn mower that is controlled by a neural network capable of distinguishing sand, concrete and gravel. On Mars, such networks could keep rovers exploring rather than waiting for instructions. Howard has always been clear about her own path. Her parents ran a company in Pasadena, Calif., that engineered railroad-signal components. Their work inspired her to learn to solder and familiarize herself with machine parts. Three years ago, hoping to encourage others to follow in her footsteps, Howard launched a math-and-science mentoring program for at-risk junior high school girls.Fighting cultural pressures takes time; one talented math student told Howard she planned to be a hair stylist. Still, Howard hopes the program will help steer more young women into robotics, a field she says that within a decade will produce robots that mimic human thought processes. "This isn't about mechanics," says Howard. "It's about creating something new, something like us but different  something that can live."